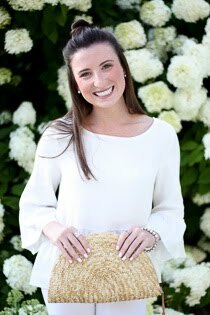 Faith and Fancy : What's In My Beauty Bag? I'm not sure about you guys, but all my makeup tends to run out at exactly the same time, which subsequently results in purchasing it all at the same time - aka one big trip to Sephora. As I think about it now, I guess this makes things more convenient for me as I am not going back and forth to Sephora all the time, which could be dangerous, however it definitely ends up being quite the purchase. You don't realize how quick beauty products add up! 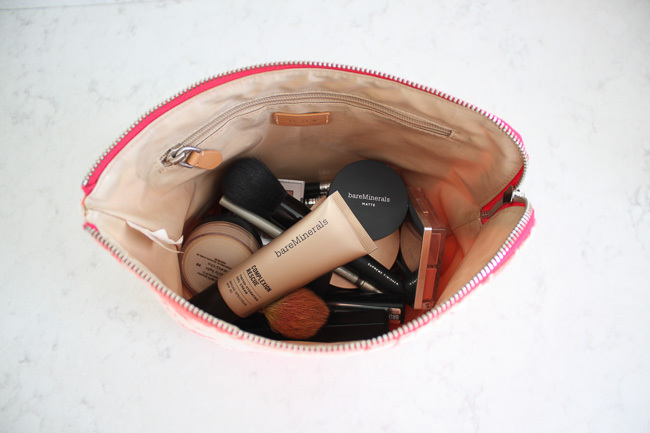 I recently made a couple trips to Sephora to stock up on my everyday beauty products, and thought it might be fun to share what I keep in my beauty bag. 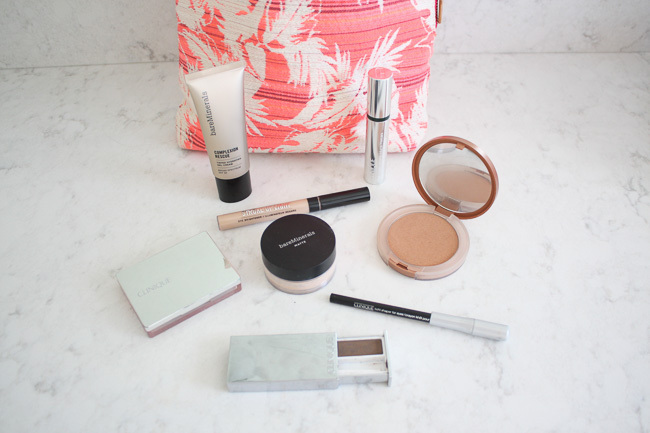 My makeup bag is full of my go-to, tried and true products that make up my daily beauty routine. 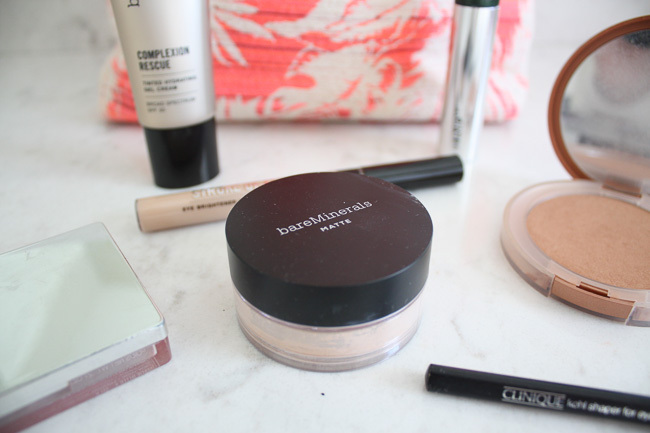 For the most part, the contents of my makeup bag have remained pretty consistent over the years, especially the basics. Of course, I am all about trying new products, but there is nothing wrong with finding what works for you and sticking with it! 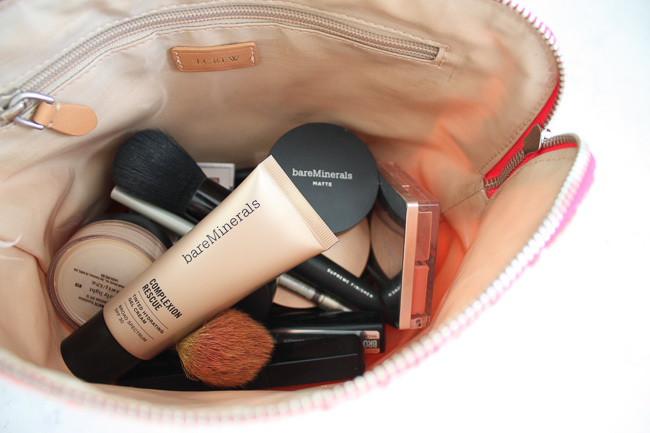 For my face, I have been a long time bareMinerals fan. If you've been reading Faith & Fancy for a bit now, you probably already know this! 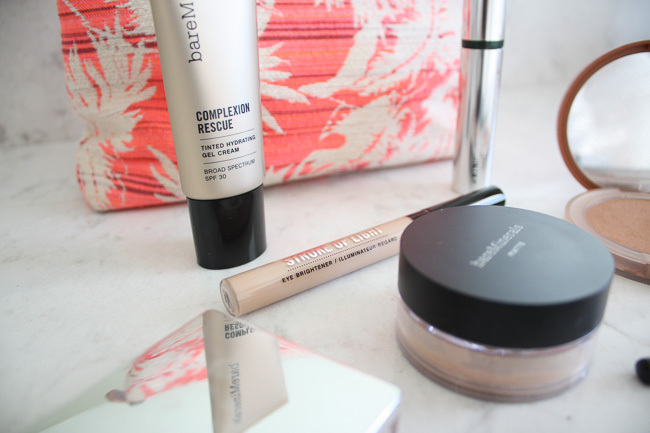 I shared my love for bareMinerals complexion rescue and matte powder foundation in this post, and recently my new obsession with their Stroke of Light eye brightener. 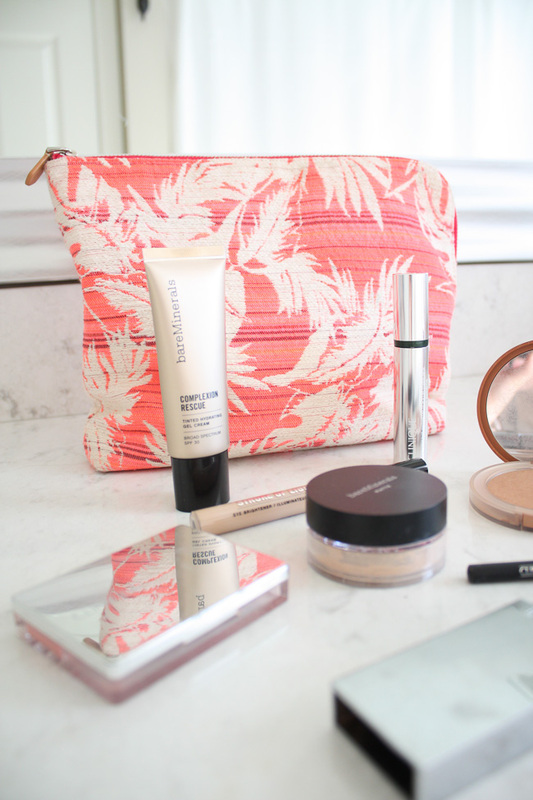 All three products are must haves in my opinion, and in all my years of using bareMineral products, I have yet to be disappointed. As far as adding a little touch of color to my face, Clinque is my go-to. I am in love with their bronzer. I have naturally fair skin, so it is extra important to have the perfect bronzer that doesn't leave me feeling orange or too brown, and Clinique's 'True Bronze' pressed powder bronzer is the one. I recently ran out and contemplated trying a new one, but I just couldn't do it! It's too good. As far as blush goes, I use Clinque's 'Blushing Blush' powder blush in the precious peonie shade. It adds the perfect pop of color, while still looking natural. I keep my eye makeup game pretty simple - mascara and eyeliner at most. In all honestly, I used to wear both mascara and eyeliner daily, but for the most part I just wear mascara these days. I still reach for eyeliner for a night out on the town, or when I want to look a little more made up, but for the most part, a few swipes of mascara is the extent of my eye makeup. I just did a round up of my favorite go to mascaras and Clinique is the brand I have always used for eyeliner. Their kohl shaper eyeliner never disappoints! My brows were never something I used to touch when it came to makeup, but let me tell you, giving them just a little love makes a world of difference! 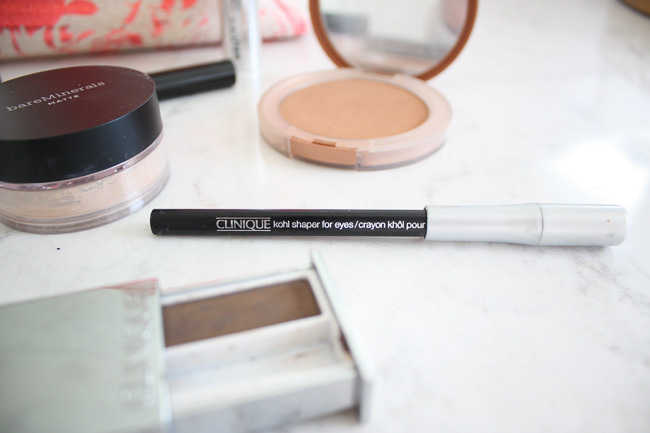 I use Clinique's brow shaper, and it works wonders! Filling in your brows even just a little, makes them look bold and dramatic in the best possible way. So there you have it! 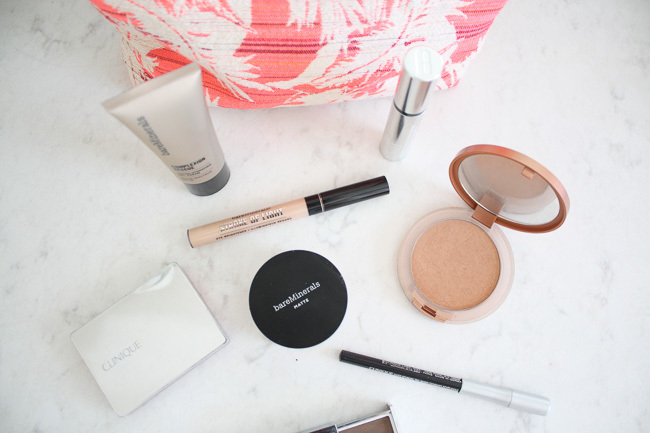 My go-to makeup basics that you can be quite certain are always stocked in my makeup bag. I would recommend any and all of the above products, and if you're in the market for some new makeup definitely try these! 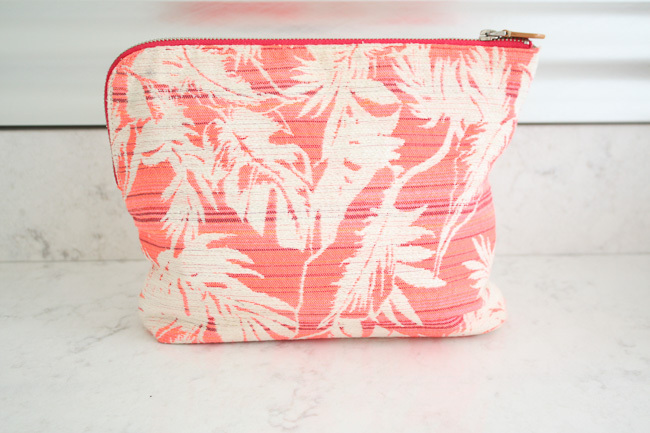 I've linked them all below (and a few cute makeup bags!) so you can easily shop and give them a try. Enjoy!